The above quotation attributed to the late British prime minister Winston Churchill aptly sums up what has happened to Kodagu (Coorg) after gaining Independence. It may sound unpatriotic, but it is fact that Kodagu was better off under the British. As a result of the long British rule since 1834, Kodagu had a stable government and well-oiled administrative machinery. The good times continued for a few years after Independence. After India attained Independence, Coorg became a Part ‘C’ State. The Part ‘C’ States Act, 1951, provided for a new Coorg Legislative Assembly with 24 members. The Coorg government started functioning from March, 1952. On what followed the merger of the Coorg State with Karnataka has been well summed up by journalist C.M. Ramachandra in his foreword to the book ‘Rise and Fall of the Coorg State’. November 1, 1956, will go down as a Black Day in the history of Coorg, now officially known as Kodagu, the tiny hill district in the state of Karnataka. The Coorg State was snuffed out of the Indian map on that day due to political machinations. The once bountiful Coorg State has been reduced to the status of a colony by the rulers of Karnataka since its merger. With Kodagu, represented by just two MLAs, successive governments in Karnataka have neglected the development of the district. The fact that the elected representatives from Kodagu have sold their souls to the timber lobby has not helped matters. It is no secret that these elected representatives have patronized the sand mafia and other illegal activities in Kodagu, including liquor vends. The timber merchants, mostly hailing from the neighbouring Kerala State, did not spare even the Devara Kadus (sacred forests), the forest buffer maintained by Coorg clans for centuries. Two Congress ministers from Kodagu have been instrumental in large-scale looting of timber from the core area of the Western Ghats. These ministers have been known to be close to the Delhi durbar of the party. Though Kodagu is the main catchment area of the river Cauvery, the life-line of people living in southern India, the rulers sitting in Vidhana Soudha, the secretariat of the Karnataka government in Bangalore, have actively backed the timber lobby in denuding the forest wealth in the ecologically sensitive Western Ghats. Prior to its merger with Karnataka, corruption was unheard of in Kodagu. Now, it has taken deep roots. The local people of Kodagu, known for their honesty and straightforwardness, have been forced to indulge in corrupt practices to get their work done in government offices. The land mafia from Bangalore has bought huge tracts of land in Kodagu to indulge in speculative land deals. The entry of underworld figures into Kodagu has affected the tranquility of the district. While elected representatives from Kodagu have looted the forest wealth, chief minister Siddaramaiah of the Congress party, has turned Kodagu into a communal laboratory by observing the birth centenary of the tyrant Tipu Sultan. While the Congress has divided the people in Kodagu on communal lines, the BJP has converted the peace-loving Kodavas as the foot-soldiers of the Hindutva brigade. The Kodavas are being used as a cannon fodder by the Hindutva brigade to achieve their hidden agenda. The late Dr M.M. Chengappa, who was instrumental in building the BJP in Kodagu, did not get his due in the party. The neglect of Kodagu district by successive state governments after its merger with Karnataka in 1956, has led to the demand for separate statehood or autonomy for the hill district. After having witnessed the phenomenal development of the area when Coorg was a Part ‘C’ State during 1952-56, there has been a growing perception among the original inhabitants that Kodagu would continue to remain a backward area as long as the district remained part of Karnataka. Dr Sandeep Shastri, a social activist, is of the view: “Given the contemporary reality and the nature of politics and political processes in India, what best can the Kodagu region and its people hope for? It may be a bit far-fetched to demand the status of a separate state at this point of time. There are larger regions with stronger claims for a separate state that the Indian Union finds difficult to concede. It is clearly apparent that the Central government will not re-open the states reorganisation question but will take up individual demands from time to time. In this context and keeping in mind the best interests of the Kodagu region and its people, it may be more worthwhile for a limited autonomy being sought. The creation of an Autonomous Kodagu Council within the State of Karnataka may be a more viable option. DIDDALLI TRIBAL UNREST: IS A.K.SUBBAIAH FISHING IN TROUBLED WATERS? Not only Coorg, there are some other provinces where it is felt that the British rule was better than what they have experienced under free India’s leaders. To name some of them Meghalaya is one and even Calcuttans contend that the civic agency including the tramways functioned properly when the British were at the helm. Many elders in the Twin Cities of Hyderabad and Secunderabad admit that the Nizam’s governance was better and evident was the communal harmony those days…. Even an attempt at autonomy will be attacked by vested interests, these groups want to erase Kodava history and our very presence from this land. It is Kodava blood that was spilt most to protect it down the centuries. I am surprised you still hang on to the theory that a couple of ‘self-serving’ politicians of Coorg merged Coorg with Karnataka. This perception is prevalent with many Kodavas. However, you as a seasoned journalist continue to downplay the States Reorganization on linguistic basis that was decided by the Parliament and finally implemented in 1956 in accordance with the 7th Amendment to the Constitution. The self-interest of the self-serving politician, my father C.M. Poonacha, would have been better served had Coorg hypothetically remained a separate state. There is no doubt he was the most popular politician at the time, and being the chief minister of a state would have been far better than a minister in Karnataka (that ministry fell within a year!). You also fail to highlight the facts that Coorg did not qualify for separate statehood on three important criteria: 1) No language of its own with a script, 2) Too small an area (4010 Sq. Kms), and 3) Too small a population (less than 2.5 Lakhs at the time). Hypothetically, if Coorg was retained as a separate state there would have been at least 300 more aspirants across India with better parameters. States Reorganization would have gone chaotic. C.M. Poonacha opposed merger to start with, but had to go by the decision of the Parliament, and facilitated the process. Coorg was a ‘Model State’, it was ‘Ram Rajya’ etc., thanks to the Brits (regretfully!). Its steady degradation is due to many other factors as elaborated by you. But merger was inevitable. NONE could have prevented the agony. But ethnically Kodavas & Kodava culture was distinct enough to claim a separate State notwithstanding its geographical & demographic size! A Union Territory status would have been welcome had the political leaders of that time shown the sagacity to pursue it instead of falling trap to promises of self- aggrandizement! Politicians looted our natural resources by destroying our forests for their greed and made our district communal after Independence. Great reply Mr Belliappa. Nobody could have stopped the merger with the Indian Union. 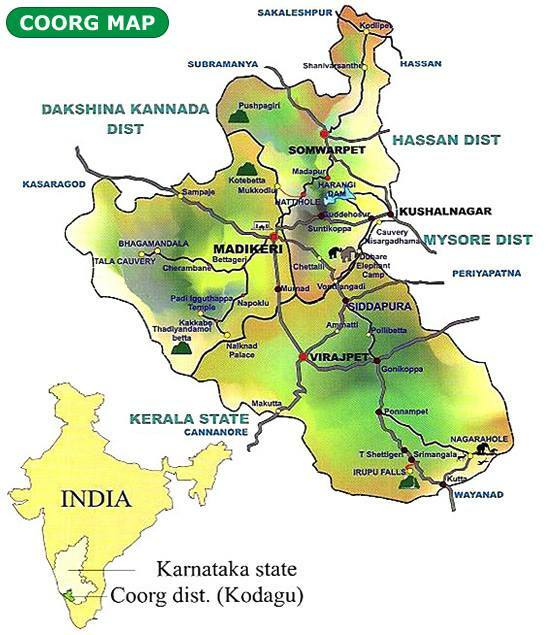 Whoever merged let them bring back Coorg State, if not……. Pay. It is sad that many in Coorg believe, and are made to believe, that Coorg was an isolated case in India, when it was merged with Karnataka in 1956 by self-serving politicians. Thanks to the internet, details of States Reorganization Commission, States Reorganization Act and the 7th Amendment to the Constitution of India are easily available to know the ‘Why’, ‘How’ and the ‘Basis’ for reorganizing the nearly 600 states in India at the time of Independence in 1947. Coorg was one of tiniest Part C states to be merged with its larger neighbour on linguistic basis. Interestingly no one talks about the 565 princely states (Part B states) that were merged. They lost not only their statehood, but also the princely status. The royals lost their kingdom, throne and crown. Were these royals given a choice? Did they have a choice? Moreover, except for J&K, none of the Part B states was retained as a separate state! Can anyone tell me how Coorg could have got an exemption and special status in 1956? As I have mentioned several times earlier, Coorg has suffered because of merger, but it was unavoidable. I don’t think people are really pondering this issue deeply enough to research the re-organization of states in India! It is more of a psychological thing. People are feeling helpless, don’t see ways to regain control over the situation and end up with “if-only” debates and discussions. It is easy to regret past decisions forgetting that those decisions were taken based on the situation at that time. We are better off using history as a lesson to improve the present rather than as a scapegoat for everything that is wrong with our world today.